The media can be complex, and manoeuvring through their world to secure much-needed coverage can be tricky. 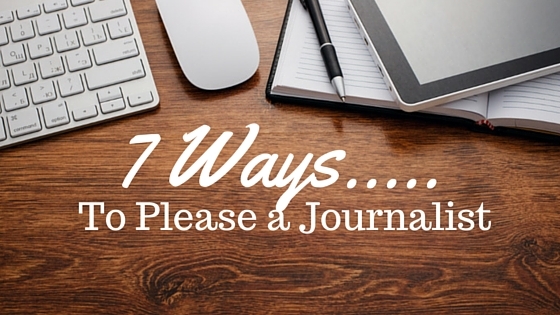 Heres 7 ways to please a journalist. Public Relations agencies and journalists have been working side by sideover many years. They understand each other, and Public Relationsagencies in particular know what journalists are looking for anewsworthy story that is going to increase their readership. Whilst yourbusiness may have many interesting stories to tell, Public Relationsagencies have skills in the fine art of how to tell those stories to get younoticed. Whilst journalists love a good story, it cant be fictional! If yourepreparing a press release, the information must be clear, concise andaccurate. Whilst journalists are used to fact checking, the work you cando for them to ensure the story is correct, the more likely they are to useyour story. Journalists work to strict deadlines on a daily basis. Whilst they may bekeen to run your story, if their deadline is not met, you would have missedthe coverage boat. Worse still, ignoring or missing deadlines can damagethe relationship you have with the journalist, all but eliminating anychance you have of future press coverage. Journalists dont always work office hours. They may be wrapping up ona story at 6pm, 7pm or even 10pm at night. If you are keen for thecoverage, the best tip is to be available. Have your mobile on and readyfor the call, especially if you have submitted the story that day. Whilst we are all busy in todays world, journalists are always up againstit, meeting multiple deadlines. The best way to build a relationship with ajournalist is to be helpful, go out of your way to provide additional factsand figures, set up interviews and pictorial opportunities or just be onstandby to answer a question about your business, service or product. In todays world where everyone is competing to get their message heard,images and visual content has become more important than ever. If youhave quality images to accompany your press release, send them out. Ifyou can set up a quirky picture opportunity for the media; even better.Its all about creating a point of different for the journalist. A differentstory angle, or an interesting way of looking at things and images oftenhelp to tell that story. Sometimes a journalist is happy to run with your story using the angleyou have chosen, sometimes they like to take it in a new direction. Itsimportant to remember that once a news release leaves your computer;its an uncontrolled medium. The story is out there for mediainterpretation. Public Relations agencies are skilled in ensuring keymessages are delivered well. If you are going it alone, bear in mindstories can take different directions, and most of the time, this will be atthe journalists discretion.